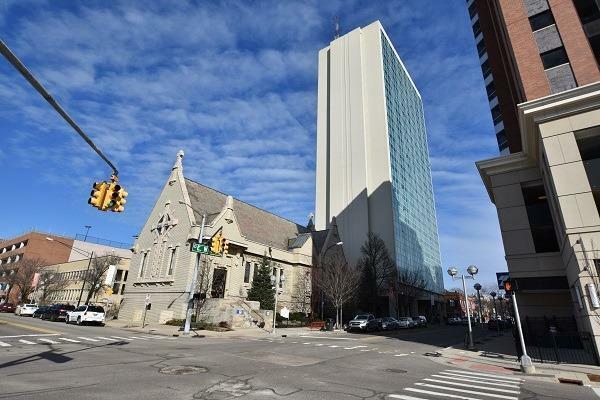 This is a rare opportunity to own a top floor unit in Ann Arbor's tallest building. A highly desirable and hard to find Grand One Bedroom floorplan. Prime downtown location, just one block from UM Campus in the quiet State Street area. South side unit with a breathtaking view of Campus and the Big House through full width panoramic windows. Quiet, secure building has 24 hour lobby security, soundproof walls, on site laundry & storage. This is a perfect home for student, downtown based professional, senior, or anyone looking for a reasonably priced downtown residence. NOTE: this unit has been used for many years as an office. It needs to be redone, and is priced accordingly. Not extremely pretty right now, but its potential is huge. A blank slate waiting for someone to turn it into a masterpiece.